Two 15th Century wooden sculptures in a Spanish church have been unsympathetically restored by an over-enthusiastic parishioner in an amateur botch job. In a case highly reminiscent of the restoration of the Ecce Homo (Behold the Man) fresco nearly destroyed by a woman in her 80s in 2012, the previously unpainted statues have attracted international media attention. The Ecce Homo painting has since become an attraction in its own right, drawing thousands of visitors to the town of Borja, also in northern Spain. The previously unpainted wooden statues have been given a bright coating with industrial, gloss enamel paint. Mary has been given a pink headscarf and eyeliner. Another statue showed St Peter, now dressed in deep red. They are in a chapel in a hamlet in northern Spain’s Asturias region. One of the 28 residents of El Ranadoiro, Maria Luisa Menendez, was given permission from the local priest to paint the figurines, local newspaper El Comercio reported. “I’m not a professional, but I always liked to do it, and the figures really needed to be painted. So I painted them as I could, with the colours that looked good to me, and the neighbours liked it,” she told the newspaper, quoted by AFP. Asturias officials were not happy with the results. The principality’s Education Adviser Genaro Alonso described it to Efe news agency as a “vengeance rather than a restoration”.Spanish art conservation association ACRE also decried the “continued pillaging in our country”. “What kind of society stands by as its ancestor’s legacy is destroyed before its eyes?” it said in a tweet. Last June a church in the northern town of Estella employed a local arts and crafts teacher to update a 16th-Century wooden sculpture of St George. 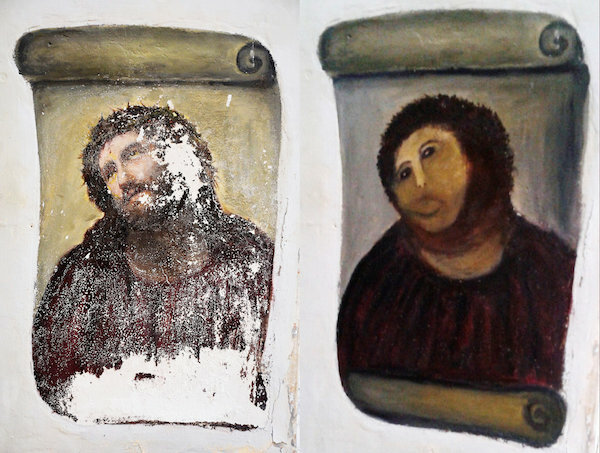 Celia Gimenez’s painting became an internet sensation last August when “Ecce Homo” (“Behold the Man”) a mural in a chapel in the town of Borja depicting Christ with a crown of thorns, was disfigured by Seniora Gimenez, while she attempted to restore it. It was re-dubbed “Ecce Mono” (“Behold the Monkey”) on social networking sites internationally. The painting has since become a pilgrimage site for art enthusiasts and the image has been used on T-shirts and wine labels. Change.org created a petition on their website calling for the church to save the altered fresco. Over 80,000 signatures calling for the parish not to make any changes to her work on the painting. Tourism officials in the town of Borja in northeast Spain say it has drawn more than 40,000 visitors and raised more than 50,000 Euros for charity. Gimenez and the local council are now set to sign a merchandising deal.